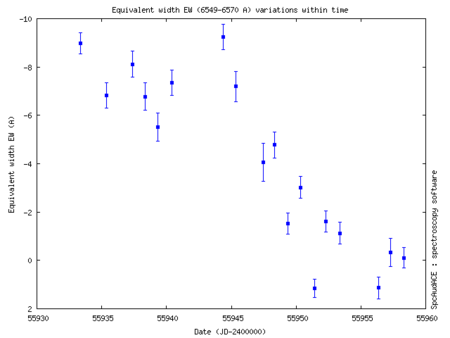 I've started a spectral monitoring of one my favorite star, FF cam. I discovered this star in 2009 by a routine survey of Be stars. Considering the Bess program, this star was observed only once par year before. I was surprised in 2009 in two consecutives nights, while redoing spectra due to bad SNR, to see how much the h alpha profile has changed. 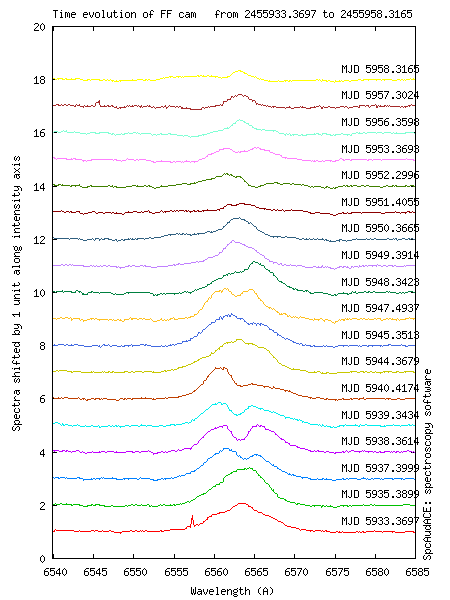 I did some others spectra in 2009 showing a great activities in H alpha and let it down for a while. At this time i was using a LhiresIII spectrograph, centered on H alpha with a power of resolution of 15000. In the beginning of January i restarted a monitoring with my eshell setup, covering the whole optical window. 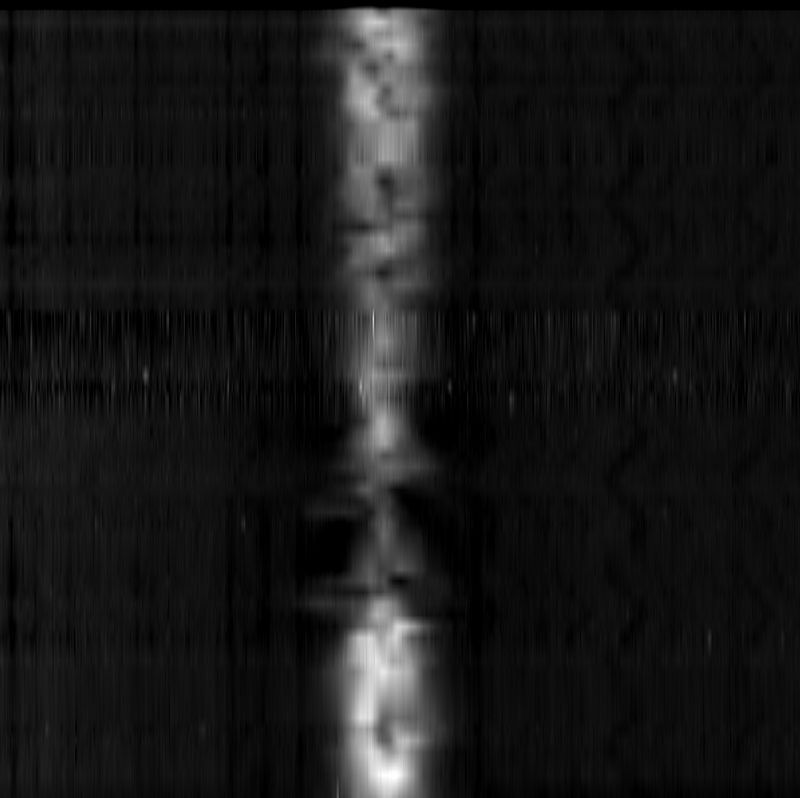 I've took nearly one échelle spectra every night from Jan, 6th trying to described completely the behavior of this star. Associated with a soft X source, this star is certainly an unknown Be/X binaries with orbit phase dependent H alpha profile. These binaries are composed of B type dwarf star and a compact object, white dwarf neutron star or black holes orbiting close from each other. Nearly 4 weeks of daily observations cannot let find any period in the equivalent widht (strenght of the line) or profile in H alpha. 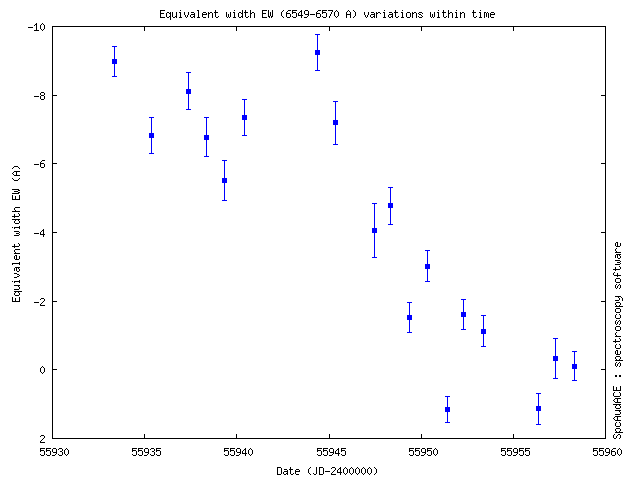 More observations are needed, as Be/X binaries may have period from tens of days to tens of weeks. So first results, sent to Anatoly Miroshnichenko University of North carolina, are presenting here, only in H alpha for the moment. 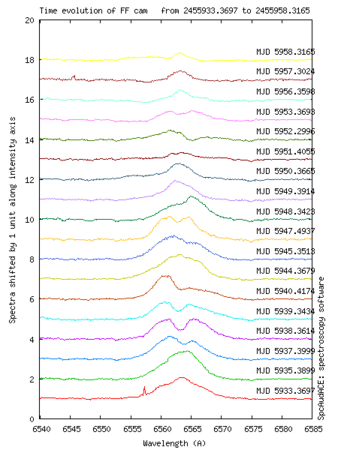 All échelle spectra are available in Bess database. Mean SNR is around 70, power of resolution is 10000, dispersion 0.1A. Enjoy observing this star as often as you can, it is circumpolar. It belongs to the realm of the rare aftermath stellar binaries among the Be star. order that contains this band to increase the signal-to-noise ratio. closely and ask colleagues for an optical photometry. Another high mass X binaries in Cameolopardis is CT cam who is a B[e], belonging to FS cma group. It is known to have a black hole around a B supergiant, with transient X ray ouburst. May FF cam belonging to the FS cma group too as it has a IR excess ?